The new year is off to a great start at Enroot with our biggest class of students to date; we couldn’t be more proud of all the things they are achieving. I continue to be inspired constantly by the resilience and generosity they demonstrate day after day. This year’s MLK Many Helping Hands Day of Service was an incredible chance to connect with so many of you. Walking into the room with my own little kids I was struck by what a dedicated community we are, that even on such a frigid day we show up, love freely, and give generously. And yet, we are reminded on a daily basis what a difficult time it is to be a person of color and immigrant at this point in our country’s history. Both the FBI report last November and data compiled by the Center for Hate and Extremism confirm a significant and deeply troubling rise in hate crimes. Now more than ever it’s essential for us to use our voices at every opportunity to stand up against racism, anti-immigrant sentiment, and hatred in all of its forms. I encourage you to attend the Cambridge Digs DEEP events, a series of conversations facilitated by Dr. Darnisa Amante and hosted by the City of Cambridge that offer opportunities to learn and become both a resource and an advocate. Thank you for being a part of Enroot’s work and for the work each of you are doing in your own circles to dismantle racism and discrimination. We need and appreciate every one of you. Somerville: Students and mentors established strong and trusting relationships this fall and winter. Mentorship comes in many different shapes and forms: sometimes it's just investing a few minutes to play an UNO game, studying for an exam, taking selfies, learning about each other's cultures, ice skating for the first time, or celebrating a small success. Mentors, thank you for everything you do. 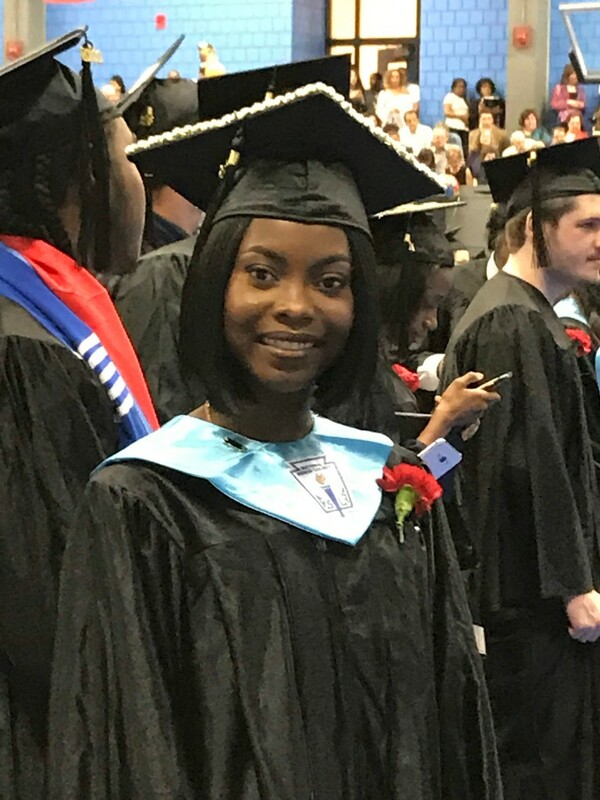 Your impact on the students is extremely important and the positivity you bring to our young adults shows itself through the students' progress. 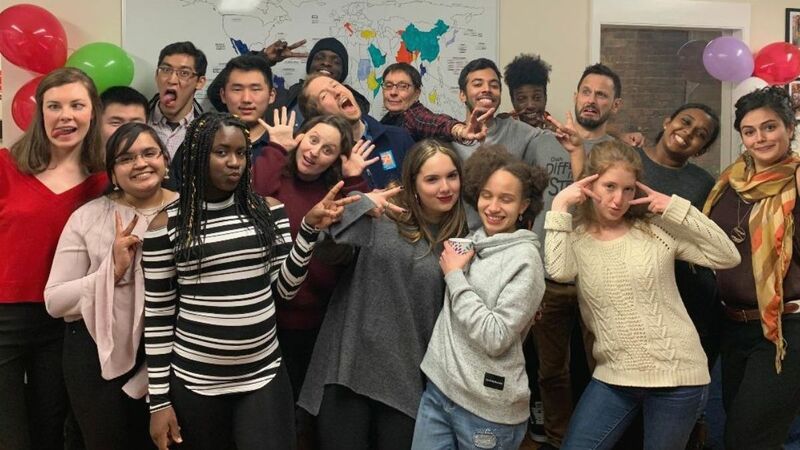 Last week, Somerville students went on a field trip to Akamai to learn about careers in technology - read more about the trip on our blog! Cambridge: Enroot Cambridge had 4 recent college visits! We went to Tufts University, Simmons College, UMass Boston and Benjamin Franklin Institute. At Simmons and UMass Boston, we met with Enroot alumni who shared their experiences with current students. It's exciting and motivating for students to be able to visit local campuses and picture themselves in college. Leadership students and their mentors kicked off the holiday season by building Gingerbread Houses together right before Winter Break. Pairs spent the first half of the evening polishing up students' resumes, and the second half constructing Gingerbread structures of all shapes and sizes. Enroot Cambridge students had a great visit to Fidelity Investment. 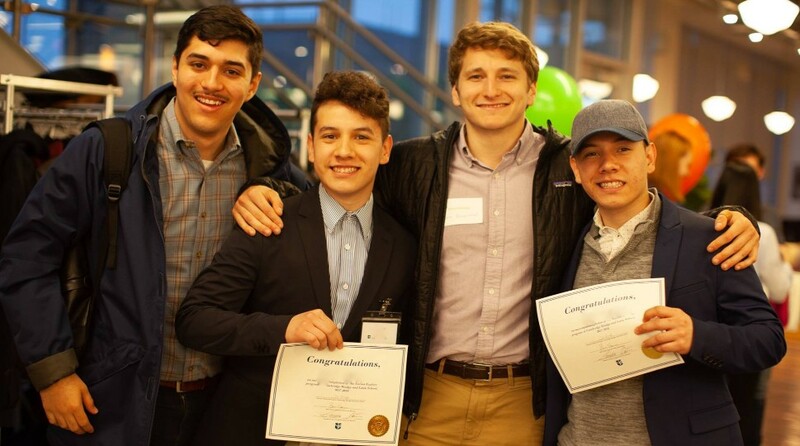 Cambridge student, Adnan, wrote about the visit to Fidelity on our blog. Students heard from speakers who told their immigrant stories and how they made it to where they are today. In addition, students had the opportunity to to practice networking and interviewing skills and in the process meet Fidelity professionals from all backgrounds. Across Sites: Our annual holiday party brought together students from both of our partner schools to play games, make new friends, and dance to music from around the world. This fall we enrolled 28 students in Enroot's new College Success program. We're thrilled that and 100% of those students are still enrolled in college for the spring semester and 46% of our students made the Dean's Lists at their schools (requiring a 3.5 GPA or higher). 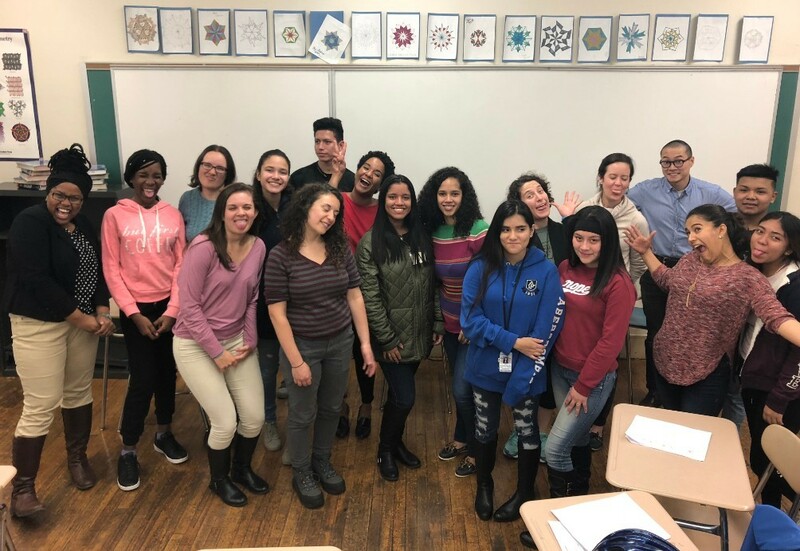 College Success students attended our recent holiday gathering with mentors and received school supplies generously donated by The Philanthropy Connection members. This winter, our Manager of College Success will conduct 1-1 phone calls, creating personalized support plans with each student. 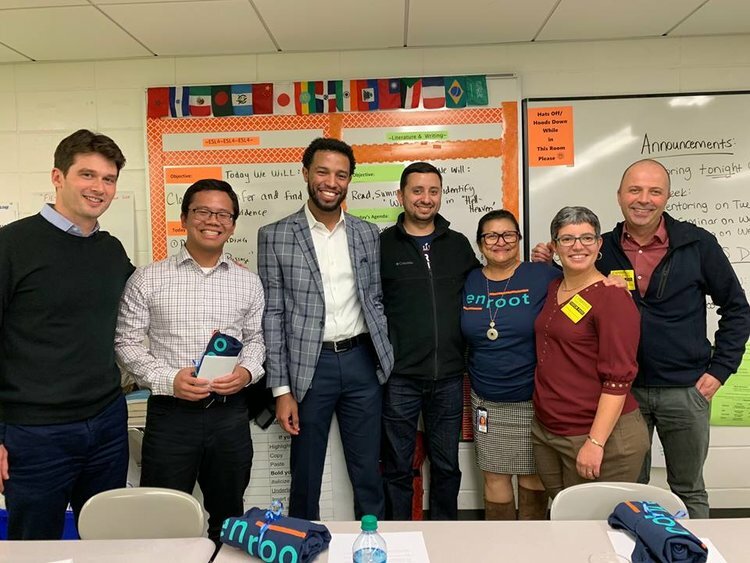 Enroot held a STEAM panel featuring careers in robotics, biotechnology, mechanical engineering, e-commerce, and IT infrastructure. 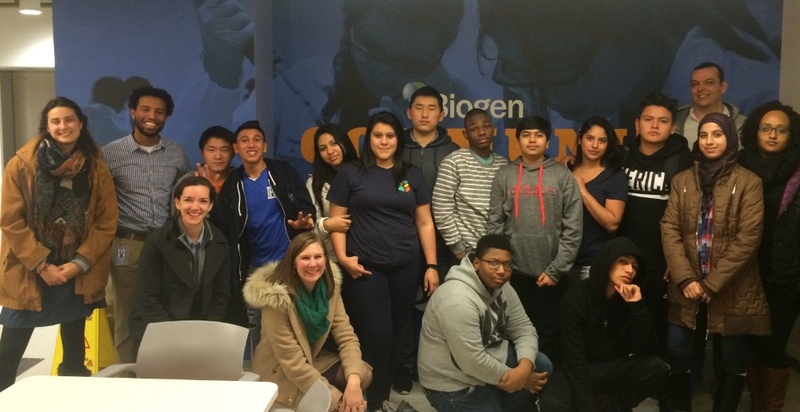 Thank you to the Biogen Foundation for including our students in the STAR Initiative and making learning opportunities like this possible! A special thank you to our panelists from Ava Robotics, Akamai Technologies, Sensata Technologies, CarGurus, and Biogen. 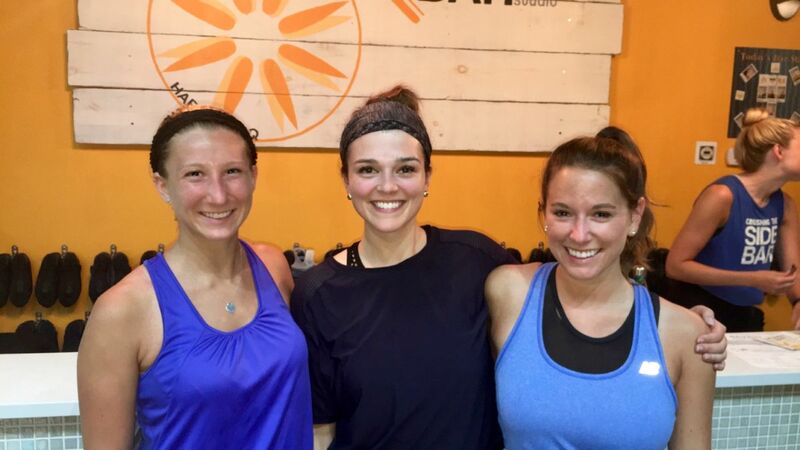 Enroot raised over $1,000 at the Handlebar Indoor Cycling Studio in Harvard Square! Enroot volunteers, friends, and community members joined a 45-minute community ride with profits going to support Enroot's work. Thank you for coming out! Check out these three articles featuring Enroot in the Cambridge Chronicle and Christian Science Monitor! Despite the freezing weather, Enroot students came out to serve their community at Many Helping Hands’ Martin Luther King Jr. Day of Service on January 21st in Cambridge. 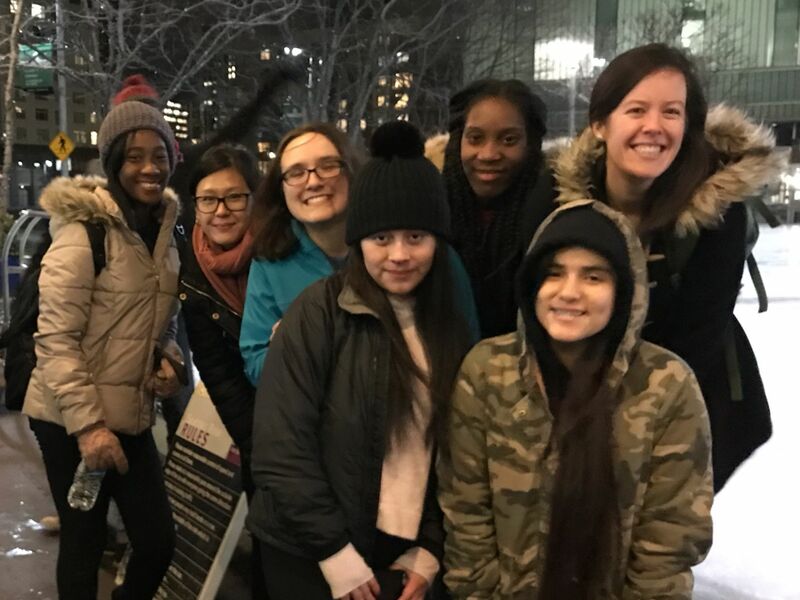 Students volunteered alongside nearly 3000 members of the Cambridge community including Senator Elizabeth Warren and Representative Ayanna Pressley, as they made scarves, blankets, and Valentines Day cards. 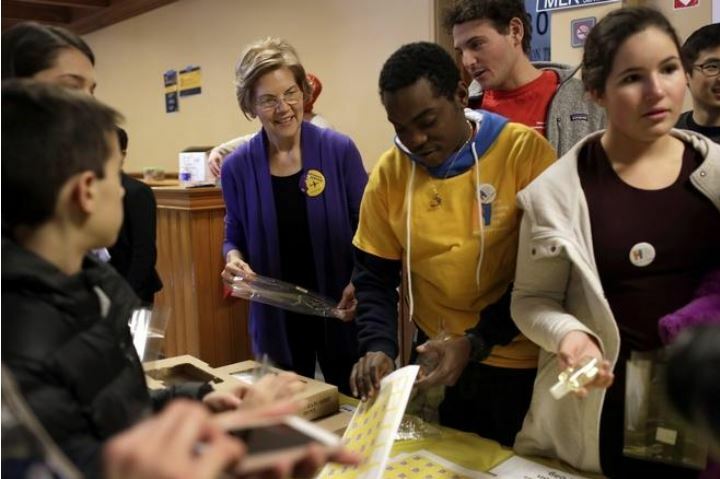 Enroot student Harry is pictured above with Elizabeth Warren in an article by the Cambridge Chronicle. What’s made rates of degree attainment for immigrant students spike? A recent article in The Christian Science Monitor looks to Enroot's work as part of the answer. 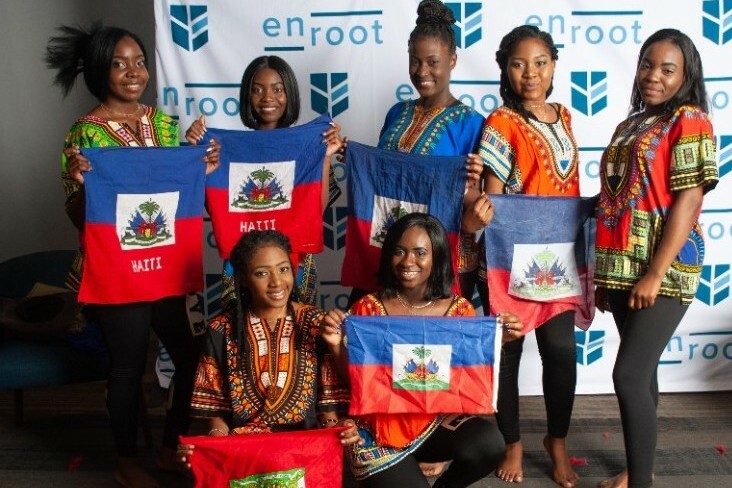 "Across the country, the education levels of immigrants have been steadily rising over the past several decades, partly because of programs like Enroot that focus on providing long-term support. In 1980, about 16 percent of immigrants had earned a bachelor’s degree. By 2016, the number grew to 30 percent, according to the Pew Research Center. This increase has all but closed the gap between immigrants and US-born residents: 31.6 percent of those born in the US have a bachelor’s degree." Executive Director Ben Clark wrote an opinion piece published in the Cambridge Chronicle in December entitled, "An open letter to the white community of Cambridge." "When I reflect honestly on racist and/or discriminatory things I’ve said or done, two decades ago or even last week, I feel a pit form in my stomach and deep shame. It’s natural to feel bad about these things and ashamed of how our actions diminish the experience of people who are dear to us. It’s also natural to wonder whether these things you’ve already done compromise your moral integrity. I believe the true test is in whether, upon more clearly recognizing how your actions impact others, you take responsibility and corrective action." Earlier this summer we watched as political newcomers challenged the existing political landscape in districts around the country. Their primary victories were just a foreshadowing of a uniquely exciting mid-term election. This year an unprecedented surge in women candidates and candidates of color present a generational opportunity to re-draw the political landscape for decades to come. It occurred to me how privileged we are to have the right to participate in an election that has far-reaching implications, especially when so many others including many of our Enroot families cannot, despite working hard and paying taxes. Especially at this juncture in our country’s history, it’s essential that all of us who enjoy this privilege utilize it to further advance equity and justice in our communities. Your vote is your voice, and the voice of so many others without one. It’s also important we use our voice to bring attention to the important issues at stake and encourage those around us to vote too. Share a message with friends about the ballot questions. Offer rides on election day to those who need assistance getting to the polls. 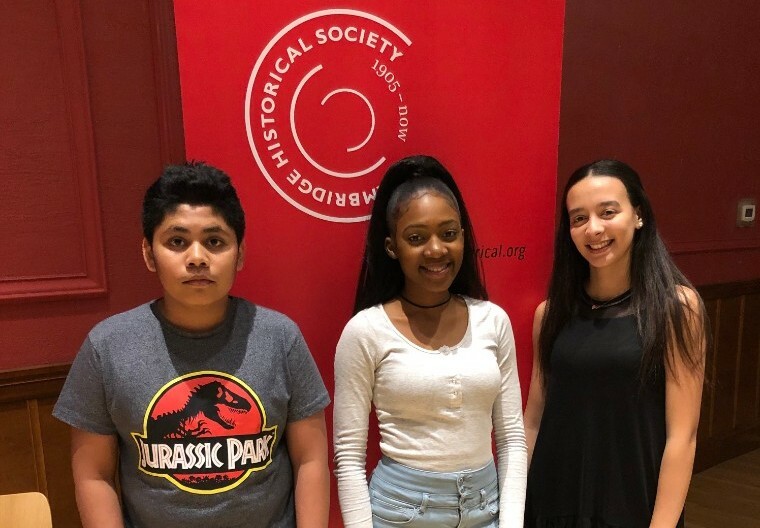 Our newsletter this month spotlights “Student Voice.” Many of our students had the opportunity to showcase their improving public speaking skills as they shared their experiences with community members at events around Cambridge and Somerville. We hope you enjoy seeing them in action. Regardless of which candidates you believe in, thanks for making sure you vote and for using YOUR voice to fight for justice. 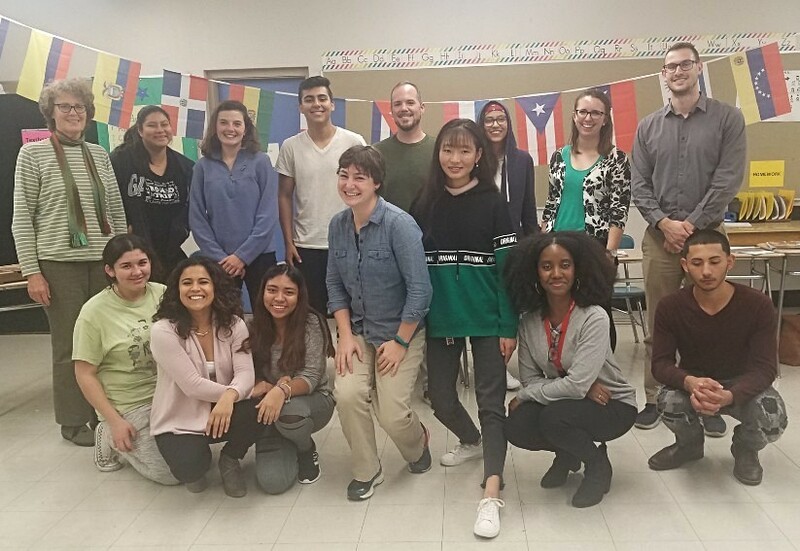 On October 10th, students, staff, and community members participated in a town hall on the State of Latino Education in Somerville with Jeff Riley, the Massachusetts Commissioner of the Department of Elementary and Secondary Education. 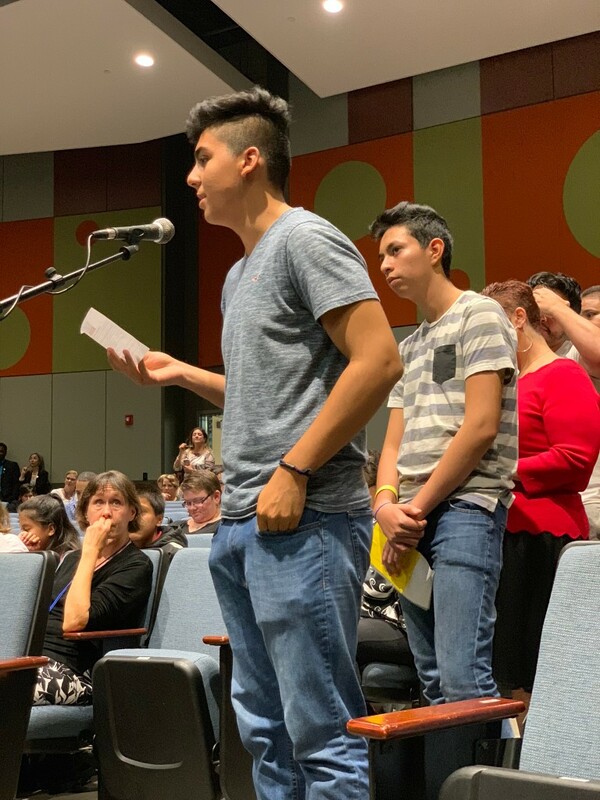 Somerville students asked critical questions about the state of education for immigrants and Latino students, ranging from the high cost of college for students without documentation in Massachusetts to creating a more inclusive curriculum showcasing diverse and representative writers and historical figures. Read more about the event on our blog. 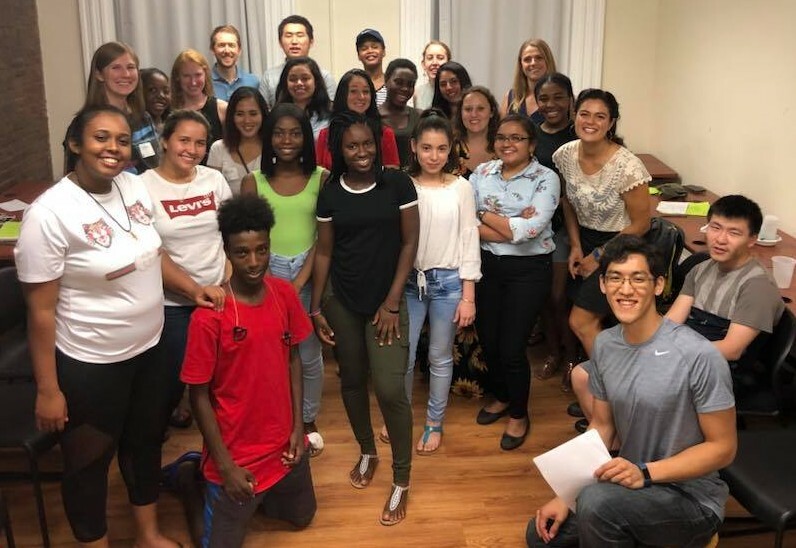 Enroot students from Cambridge and Somerville shared their stories of immigration and finding community at Cambridge Community Foundation's "The Immigrant Experience: Learning Through Art and Community Voice." The event was held in Harvard Yard, with Teresita Fernandez’s temporary public art installation, Autumn (…Nothing Personal), as the backdrop. Thank you to Cambridge Community Foundation for inviting us to participate! Read more about the event here. The Cambridge Historical Society delved into questions of identity, belonging, and welcoming at their fall event: "Where is Cambridge From." 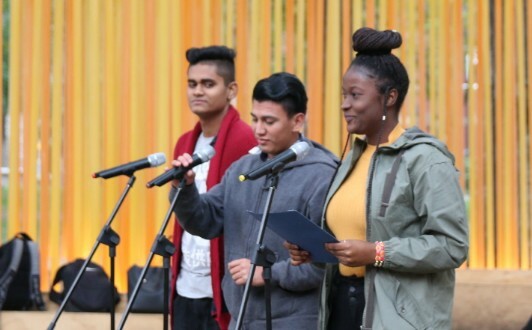 Three Enroot students presented their stories of immigration from India, Haiti, and Morocco to the United States, focusing on their journey to learn English, navigate a new school system, and find community in a new city. Read about the event on our blog. Cambridge: Students met with their mentors on Tuesday night and got to know each other over pizza through games and activities, including a rock paper scissor championship! 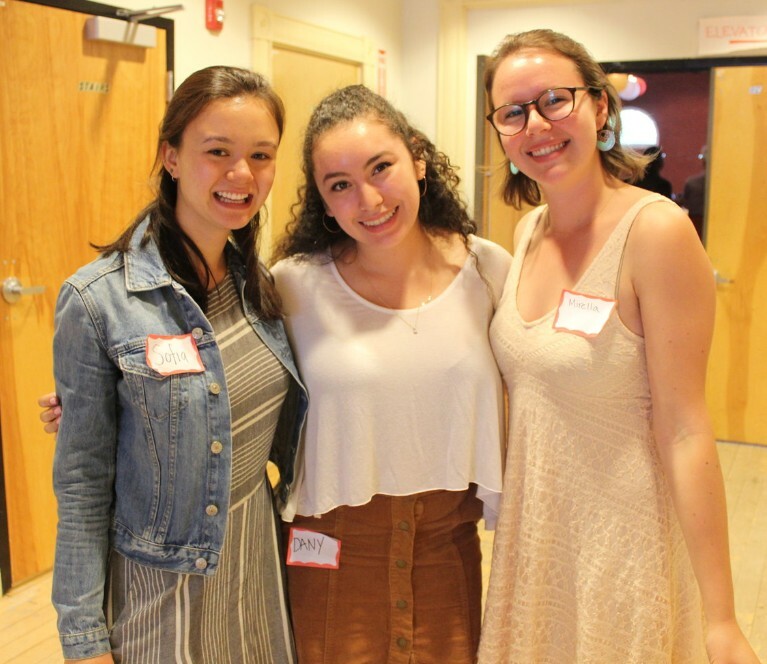 Somerville: Explore and Leadership students met their mentors at our Mentor Match nights, where they "interviewed" each other and learned what they have in common. They formed and untangled a "human knot" and played a game involving balancing cookies on their forheads. Microsoft volunteers joined us on Tuesday to put together care packages for Enroot's College Success students. 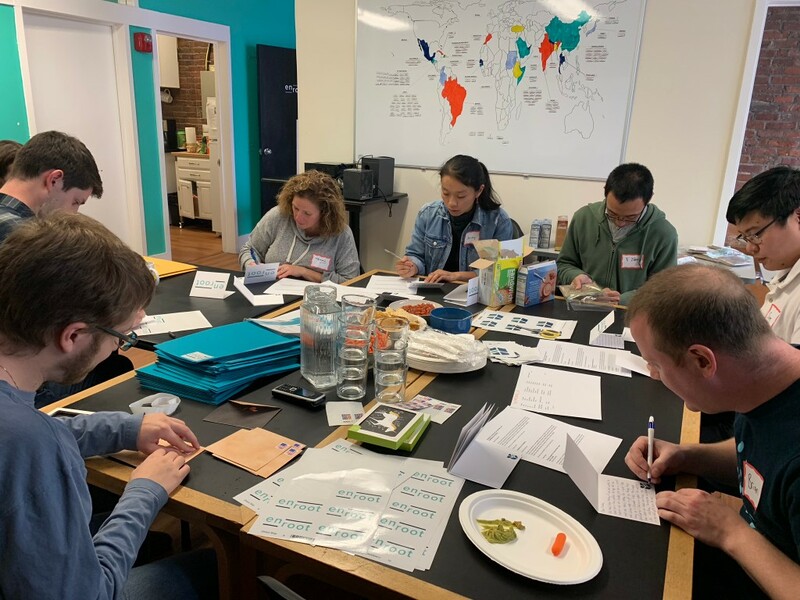 Volunteers wrote cards and stuffed envelopes to send our College Success students some extra support as they head into mid-term exams. One of our current Enroot students stopped by to ask how Microsoft volunteers found their career path and any recommendations they had for an aspiring computer scientist. Thank you to Microsoft for being a partner is hosting student field trips, volunteering, and holding micro-fundraisers for Enroot. Last night marked a momentous occasion in the history of this state and an important step toward equity for our country. We watched as Ayanna Pressley beat the odds and surprised the naysayers, becoming the first African American woman elected to represent Massachusetts in Congress. The humility and authenticity with which she ran her campaign compelled voters to come out in record numbers and cast their ballots in support of her vision. It's powerful for Enroot students to know they are being represented, locally and in Washington, by elected officials who share essential aspects of their identity and lived experience. 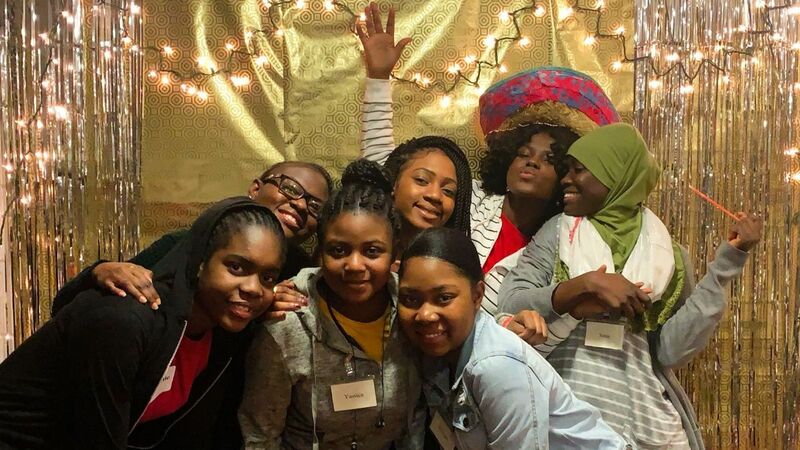 It's also incredibly inspiring for them to see a leader like Ayanna continue to challenge racial and gender barriers and prove that they can be overcome. Her courageous candidacy and underdog victory embody our country at its best and will no doubt give Enroot students renewed confidence in this country and their place in it. I'm thankful for her courageous leadership and hopeful that continued progress is coming for our communities. A week before students headed off to college, we hosted our first night of College Success programming. Students and mentors met over ice cream to talk about students' college goals and everyone enjoyed the familiarity of the Enroot office before embarking on their college journey. 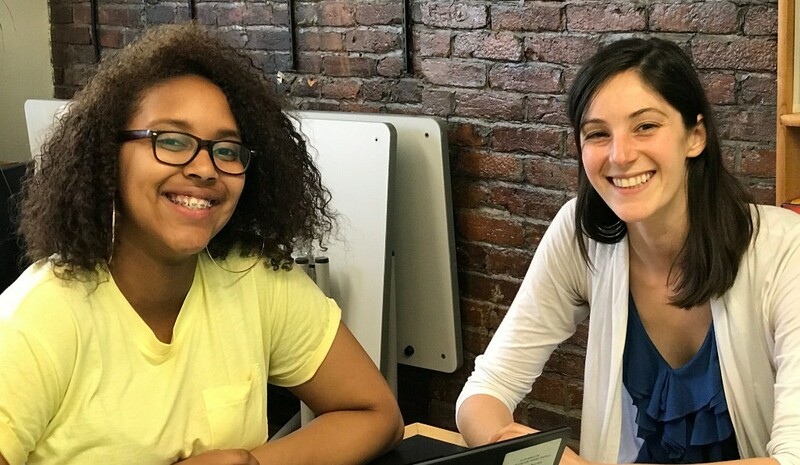 Enroot's College Success program is designed to support students in their first two years of post-secondary education through mentoring, one-to-one coaching, and support navigating the higher education system. Happy first week of classes to our College Success students! 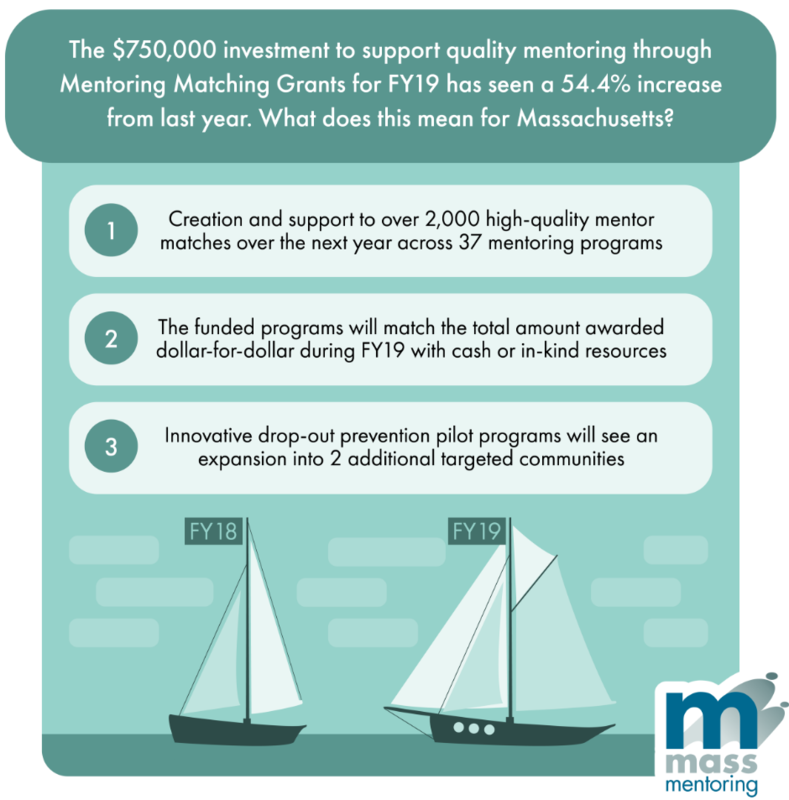 Enroot was awarded $10,000 as part of Mass Mentoring Partnership's investment of $750,000 to support quality mentoring throughout Massachusetts. This support will enable Enroot to serve 150 students in Cambridge and Somerville and provide more college access support. Read the full press release here. As we grow to serve 175 students this school year we have also grown our team. 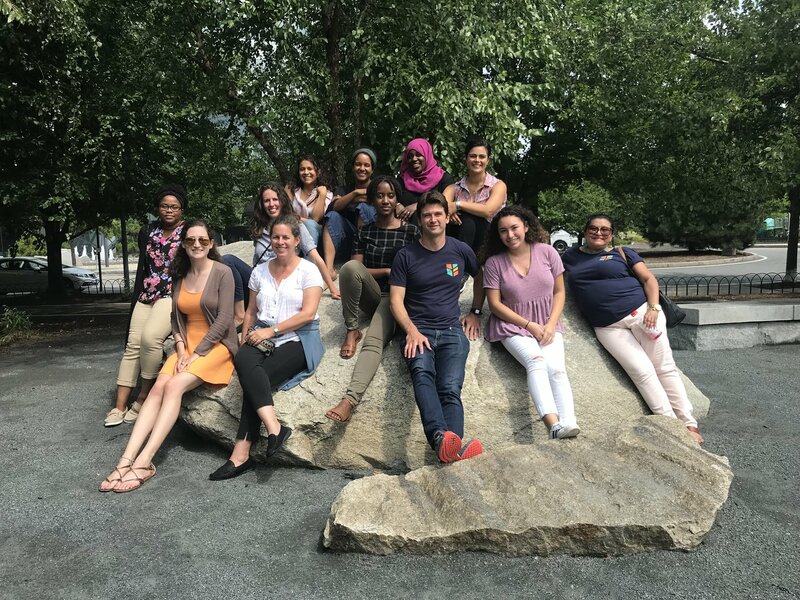 This summer we welcomed a new Program Director, two Program Managers, and three AmeriCorps members. Meet Teresa, Georgia, Paola, Tamia, Sophie, and Katie. We are thrilled to have them join our team and excited to leverage their experience in enriching our programming. Please join us in welcoming them. We are privileged to be doing this incredibly important work at this time in our nation's history. We are actively recruiting new volunteers for the upcoming school year. If you (or someone you know) are ready to be a part of this movement, please fill out an application today and we will contact you about attending a volunteer orientation. Earlier this summer a viral video showing a white Harvard employee belittling her neighbor who is the mother of a biracial child put on full display the toxic cocktail of racism and classism that often lies just beneath the surface. Sadly incidents like this are an everyday occurrence in Cambridge and most cities. The fact that this one happened to be recorded is providing an opportunity for us all to reflect on how implicit bias and the many manifestations of racism erode the dignity and diminish the experience of people of color. As the father of bi-racial children and leader of Enroot, I reflect every day on how harmful repeated racist and discriminatory interactions can be to a young person’s self-identity and emotional well-being. 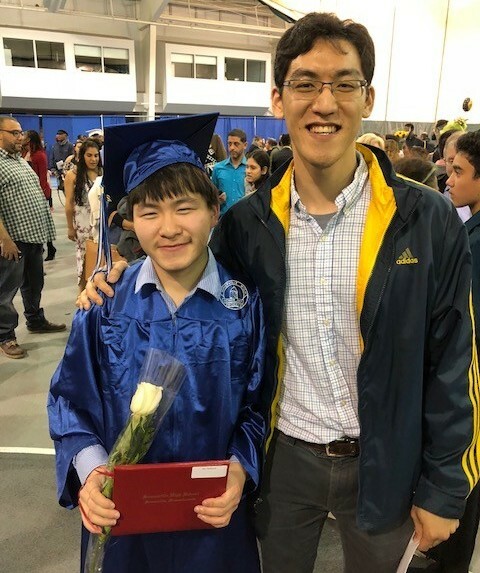 In this blog post I’ve highlighted a few more examples of how Enroot students and the larger immigrant community experience discrimination and the hard work that will be required of white residents for our communities to become more welcoming, just and equitable. This conversation brings into focus why Enroot is constantly searching for new ways to serve our students. For many years we have wanted to support our students beyond the successful completion of high school. This fall, we are excited to begin this work as we pilot our College Success and Alumni Engagement program. 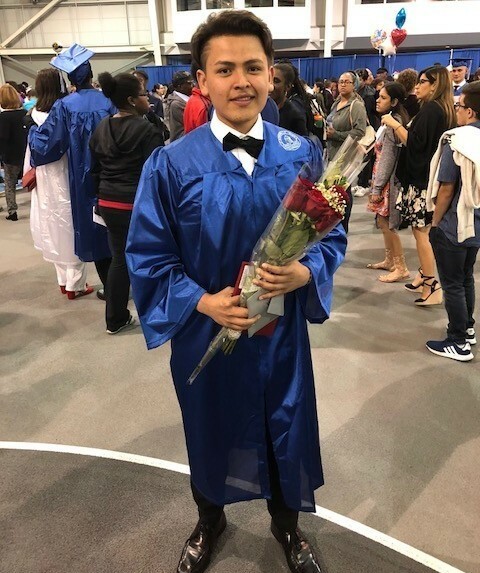 With the benefit of support and resources to transition to post-secondary education, we hope to see more students graduate from a 2 or 4-year college and become gainfully employed. 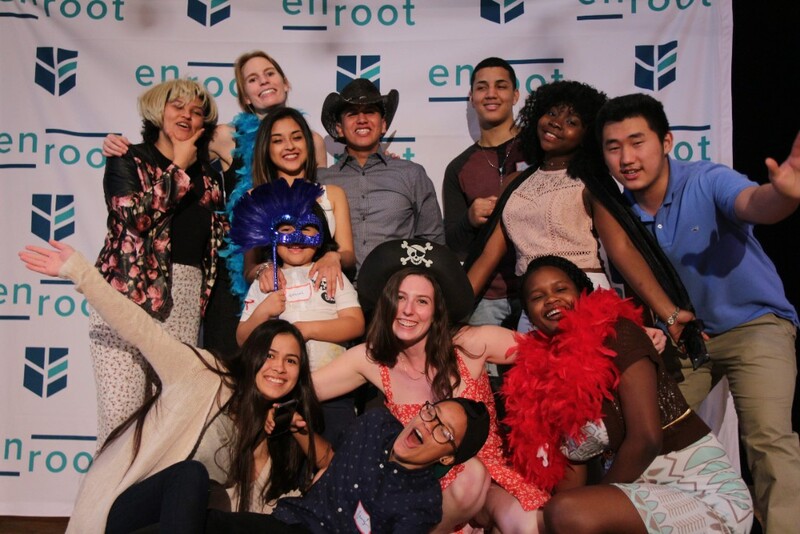 With the generous support of the Lafferty Family Foundation and The Philanthropy Connection, Enroot launches our College Success program this summer. The program is designed to support students in their first two years of post-secondary education through mentoring, 1:1 coaching, and support navigating the higher education system. College Success programming is essential in expanding opportunities for traditionally marginalized individuals and communities and Enroot is uniquely positioned to do this work alongside our students. 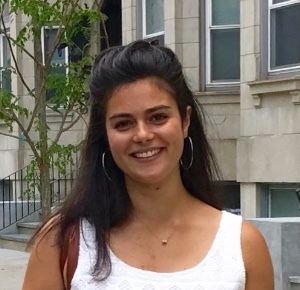 We are thrilled to announce Enroot AmeriCorps Massachusetts Promise Fellow Georgia Lederman has joined our team full time and will be leading this effort as our Manager of College Success and Alumni Engagement. Read more about our plans here. Enroot student Jarna pictured at freshman orientation. 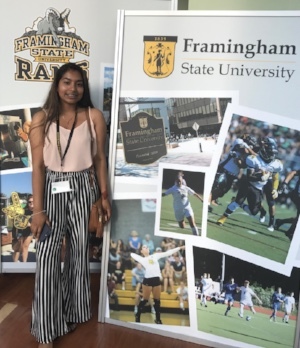 She will study Fashion Design and Marketing at Framingham State University. We look forward to working with Jarna and students like her in our College Success program! 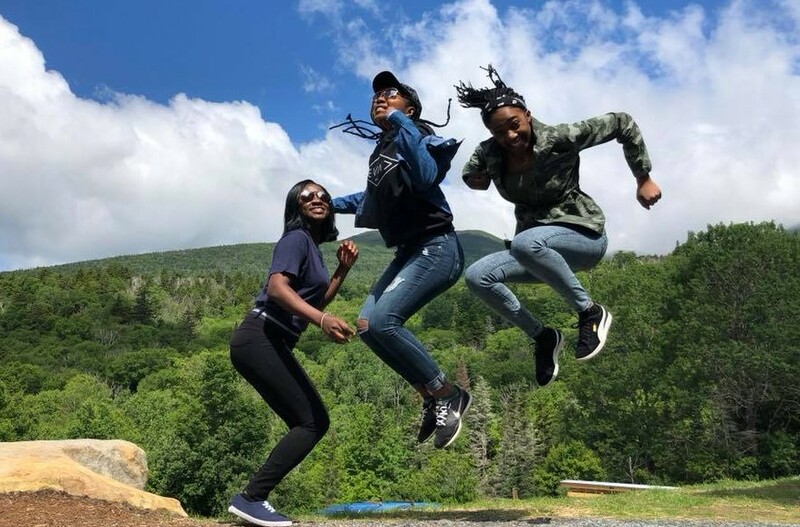 Cambridge students went with Enroot to Moosilauke Ravine Lodge for three days filled with hiking, camp fires, s'mores, friendship bracelets, contra dancing, and exploring the White Mountains. "My favorite part of the trip was the hiking and the views," said Enroot student Nafis, "I also noticed that without cell phones we have so much more time in the day without all the distractions." Read more on our blog. Would you or someone you know be a great mentor or tutor for Enroot? We are actively looking for new volunteers for the upcoming school year! Fill out an application today and we will contact you about attending a volunteer orientation this summer. We are thrilled to share that we have hired Teresa Martinez to serve as the Program Director for Enroot in Somerville. Teresa brings 13 years of experience working with youth at Year Up. She also helped launch their new site in State Street Quincy, which she then managed after the launch. 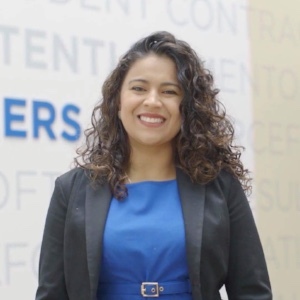 Teresa has a strong passion for working with opportunity youth and is a firm believer, regardless of cultural background or socioeconomic status, that with the right support, resources, and guidance, students can reach their full potential. Teresa was born and raised in El Salvador. 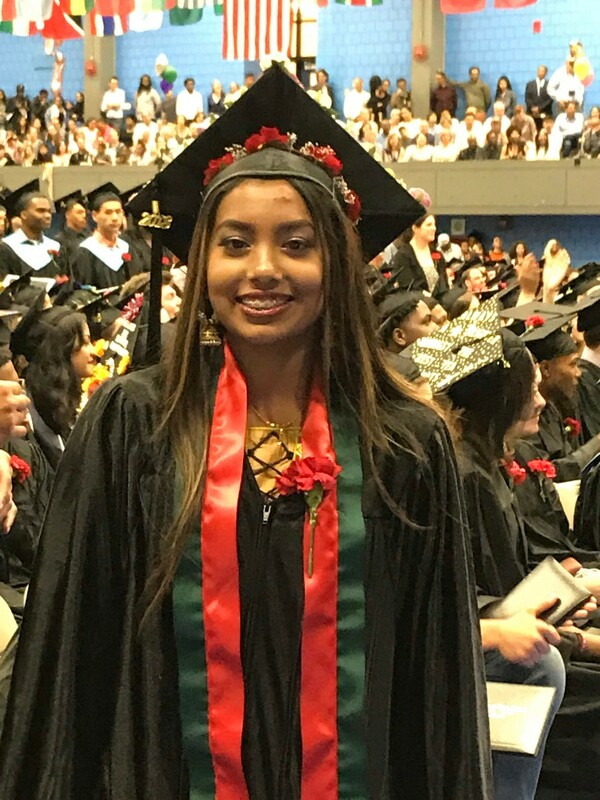 She came to the United States at the age of 15 and attended Cambridge Rindge and Latin High School (CRLS) where she learned English and also participated in the Enroot program (City Links at the time) for two years as a student. We’re particularly excited to have a program alumnus join the team and grateful for all the many talents Teresa brings back to Enroot.